This picture has been a long time in coming, and though I didn’t exactly enjoy the process of taking it I am glad to have had the experience. It serves as a companion piece, or rather a counterpoint, to a picture I posted in May of this year where a man was doing his best to spread the gospel and save souls but using a much different and, I would argue, more effective technique. 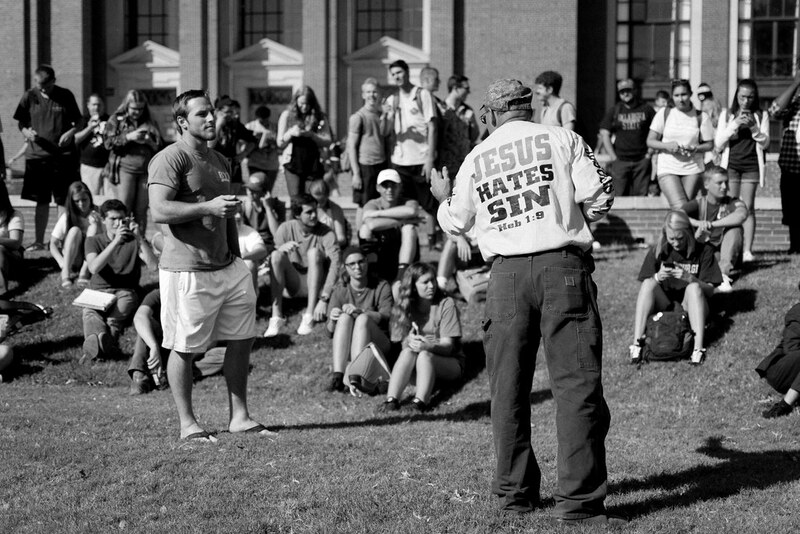 Every now and again this man, whom the students have nicknamed Preacher Bob, shows up on campus with a cohort of bible-thumpers and sign-wavers to rile up the student body from the lawn in front of Low Library. You can usually tell when they are around because of the large crowd gathers (and as Dave Piner said, nothing attracts a crowd like a crowd) and things can, and often do, get quite hostile. The pattern is similar every time: Bob waves his bible, yells at the students, and generally condemns the student body to the pits of hades for their sinful ways. Usually someone will confront him, as you can see here, and attempt to debate or discuss theological points while quoting scripture, but Bob remains resolute and will hear none of it. Some students yell and jeer, others start chants to overpower the sound of his voice, and at the end of the day I very much doubt that any progress is made by anyone involved. All this activity makes for a very uncomfortable situation, but that’s exactly why I was glad to have had the experience of taking this photograph. I stood at a distance observing the scene for a few minutes and then realized that this would be a good picture-taking opportunity if only I could work up the gumption to walk out there and start snapping photos. So I did just that. I put my D7100 in 3D tracking mode because my usual focus-and-recompose method wouldn’t work with how much Bob was walking around, and walked over to the knoll from which he was casting aspersions on the students surrounding him. There are rules when Preacher Bob or his counterparts come to campus, the most important one being that you are not allowed to get physically close to any of them. I believe this has to do with prior incidents involving physical violence, but in any case I knew that I wanted to separate Bob from the rest of the people visually so I shot wide open at f/1.8 in order to get a shallow depth of field–or as shallow as I could, given the circumstances. I initially tried standing in front of him to get his face in the shot, but wasn’t happy with the composition so I moved behind him and tried to capture his emotion through body language. I specifically waited until he was waving his hand in an accusatory manner at the student he was talking to. (Whose shirt, incidentally, reads “Brothers Under Christ, 2016 Dad’s Day, Oklahoma State University. I honestly think this student was just seeking clarification and not out to egg on the Preacher.) I did this so I could give the viewer a sense of Bob’s body language as well as the student’s emotional response since you can see his face and half-outstretched hand. Since I couldn’t show the face of Bob and the face of this student at the same time I erred on the side of the student and tried to let Bob’s body language and boldface t-shirt convey a message to the viewer instead about the type of interpersonal interaction that was taking place here. I was only here for a few minutes but I left feeling slightly uncomfortable, and also glad to have had a few years of practice using my camera so I wasn’t trying to figure out buttons or controls in the middle of what could have been a very volatile situation. I do believe that deep down Bob does believe in what he is doing, and a part of me admires and respects him for having the courage to face off against hundreds of angry and flustered students…but only a very small part. These students are angry because Bob and his kind intentionally stir controversy and discontent, instead of sowing seeds of the Gospel that will take root in fertile soil. I have seen Bob and many others like him over the years and rarely are they interested in having sincere, honest dialog with students in order to help them wade through what is often a spiritually challenging time in their lives. I’d much rather they took the route of the Gideons and I am fairly certain they would be far more effective as a result. You certainly captured the emotion well. I felt it as soon as I looked at your image. I remember similar situations on the UNL campus daily in the Union courtyard. Always made me really uncomfortable. The picture captures that feeling so well. I recall seeing street preachers at UNL and thinking how brave they were, and if only I had the guts to be that kind of a witness to others…until I stopped to listen to their message of hate and condemnation. They (and Preacher Bob, and presumably others like them) don’t seem to be interested in spreading the gospel. Instead they seem envision themselves as Jesus in the temple, kicking over the tables of the money changers and driving out evil. (Matthew 21:12) But these people are not Jesus…not by a long shot. Great conversion to B&W, also. Your photo effectively tells the news story. I catch the sense of confrontation in Bob’s stance. The student, however seems open in his body language. It is interesting, too that only a couple of the students in the crowd seem to be actually listening. The rest are tuning Bob out or are there, like you, for the spectacle. I like your analysis of the body language Rebecca, especially since you pointed out how many of the other students aren’t even listening! To them it’s almost like the whole thing is a circus sideshow, and maybe they are there to see if any big conflict arises but I doubt (though I could be wrong) that the seeds of the Gospel are landing on fertile soil thanks to Bob’s methods of preaching. Great photo! At first, when I saw it, I thought it was from back in the 1970s when I was in college in Ohio and “Reverend Jim” used to come to campus — same thing, same atmosphere. Maybe Bob was in one of those crowds back when he was in college, and aspired to be just like the roving campus preacher? In any case, your image captured the mood, especially the indifference of the students he was trying to reach. Isn’t it interesting how history repeats itself, Ellen? I’m sure once Bob puts down his sign and takes off that shirt for good there will be others to replace him, just as how Bob himself is merely a modern manifestation of the same type of person who was doing this back in the 70’s. I don’t really understand this style of ministry since it seems like it would turn more people off to the Gospel than bring them to it, but who knows. The Lord does work in mysterious ways. Reminds me of Dave Wooten and his megaphone in front of Northeast High. He took just the opposite approach that I did back in the day, shaming, ostracizing, condemning and blowing hot air through a megaphone to tell kids that they were going to burn in the fires of hell. Paul would have been so proud of him. Jesus? Well, he’s another story. There is so much more to your photo than meets the eye at first glance. I’m still processing it all. I must have missed the earlier May shot, so I went back to that one first. The two photos are polar opposites. In the May photo, I feel the calm and certain mission of the Gideon. The second, makes me tense and waiting to see what will happen next. The faces and body language of the students reflect indifference to his message. The young man confronting Preacher Bob looks sincere and wants answers to his questions. I get the feeling Preacher Bob doesn’t want to be questioned. I admire how you confronted and recorded both events. No wonder I’m afraid to do street photography, if someone with all your experience questions, “Should I or shouldn’t I take this shot.” Well done sir. I like how you describe the Gideon man as having a “calm and certain mission.” He exudes a confidence and positive spirit that this man, Preacher Bob, just doesn’t have. And you know, I think you’re spot on with your analysis in that Bob doesn’t want to be questioned. I think some part of him might be scared of hearing the questions that students ask, or not sure how to answer. Well done, Carolana. Very expressive photo! The composition is perfect. The B&W is effective as it does take away much of the distraction of his shirt (amazing that he doesn’t think it’s a distraction). I was once a part of groups who thought similarly about ministry (though I never did what this guy is doing). They really think they are doing God’s will like Jesus did and that the opposition they face is the persecution that Jesus talked about, never realizing that they themselves unnecessarily caused it. It makes them even more proud and firm in their resolution. In fact, I think they would feel insecure otherwise. My thinking is: Where is the joy that the angels announced to the shepherds about the birth of a Savior? This joy is evident in the post from May that you referred to. Sorry if I strayed from the photograph itself, but your picture brought back memories. But maybe that’s the point—to tell a story and even evoke emotion. Well done! Tim, I don’t think you strayed at all. You answered the questions that this image posed. I was not brought up in a fire and brimstone style of worship. I did not understand why some are so confrontational in their style. We were on vacation, on the beach, at sunset and a local group was there to pound the word of the Lord into the Heathens. As expected reactions ranged from apathy to indignation. My 12 year old and her friend took it all in and declared the group stupid. On their own they discussed the Love of Christ and that a good Father would not treat his children so. A proud Momma moment from someone who has strayed from her church.